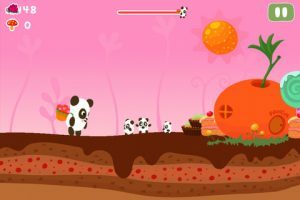 The full version ofPanda Sweet Tooth, developed by Targeting LLC, is the perfect iPhone game for anyone looking for a time waster that’s as cute as it is fun. 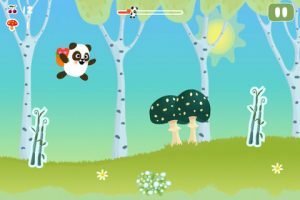 While it may not be the most original concept out there, the bright and charming visuals, fun music, and surprisingly tricky controls combine to make a game that’s pretty darn entertaining. 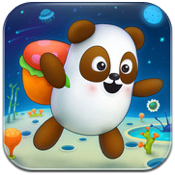 There are 30 levels in total, stretched out across 6 different environments. And as should always be the case, the game gets harder the further you progress. 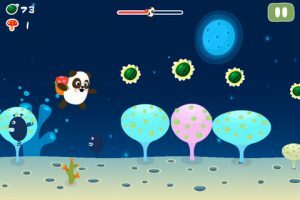 There’s an excellent difficulty curve, and the side-scrolling style is classic enough to remind seasoned gamers of their younger years playing similar games on old consoles. That’s not to say the art is dated: it’s fresh, whimsical, and totally family friendly. The saturated color palette and adorable character design make it the perfect choice for the kids or ladies in your life. But most satisfying of all are the controls. While the various motions are simple enough, executing them precisely presents a unique challenge. Steady hands will prevail, however, if you practice each level long enough. Not sure if you’re ready to buy? You can try out the lite version here, which gives you 3 levels for free, but makes you pay for more after that. Either way, we’re sure you’ll enjoy all that Panda Sweet Tooth has to offer. 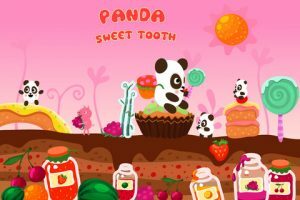 Panda Sweet Tooth HD is also available for the iPad. Panda Sweet Tooth is compatible with iPhone, iPod touch, and iPad. Requires iOS 3.1 or later.